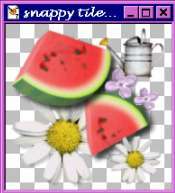 Making Seamless Background Tiles with the Snap To Grid option. Knowledge of PSP 7 Tubes and Layers assumed. Grids and Rulers make creating images easier. You can precisely align a selection or create perfectly matched shapes. And with the new addition of "snap-to grids" to Paint Shop Pro 7, it makes it even easier and quicker. By clicking on :File >Preferences >General>Rulers&Units you can change the grid horizontal & vertical default spacing and line color. I like to keep my default spacing at either 25 or 50 and my line color is dark red. 1. Okay now we are ready to begin -- create a new image 206x206, transparent. **It is important to use these particular dimensions for the size of our image, because we will be cropping later and the final image size we want to end up with will be 200 x 200. 2. This is the part where you can let your individual creativity come out...Take a bunch of tubes and just go crazy...add some colored spheres, some flowers, some spiders. Whatever theme you would like your background tile have. I am going to use some summertime tubes. Add your tubes, but do not let any tube go out over the edge of your image (including any shadows in your tube image). Keep them at least 3 pixels from EACH edge -- we are going to crop off the edges later and you don't want to lose any of your tube images. If it makes it easier, make a new layer for every batch of tubes you add and then use the mover tool to arrange each layer. You can save your image at this time. 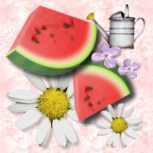 Save as .psp extension. (If you plan on opening your image in previous versions of psp, then click on the options button, and choose the appropriate compatibility). 4. Change your foreground color to a light color. And make your background color swatch white. Choose a TEXTURE for just the foreground color. I am choosing "Terrain". Choose a texture that will not be too bumpy. 5. Add a new layer, and drag it to the bottom of the layer palette under the tube layer. 6. Using the FLOOD FILL tool, RIGHT CLICK on your mouse and fill this layer with the white background color. Then LEFT CLICK with the FLOOD FILL tool; it should have filled it with a textured foreground color - cool, huh? Okay, now click Layers >Merge >Merge Visible. Save Save Save!! !